Shortly after 7 a.m., a mainline blockage at 3355 Broad Street resulted in a spill of 3,000 gallons of sewage. 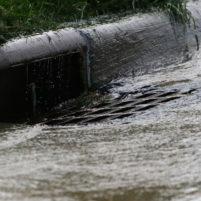 The sewage then flowed into an adjacent storm drain that leads to Acacia Creek. By about 9 a.m., county staffers had contained the sewage spill and cleanup was completed. County officials are asking people to avoid contact with the Acacia Creek for the next 72 hours because of increased bacteria levels. Representatives from the County of San Luis Obispo Environmental Health have posted signs at the Damon Garcia soccer fields advising the public to avoid water contact at this time. If this happened to anyone else the fines would be astronomical! Really got excited at first when I heard this, I thought they were beginning to drain the swamp. I thought it very interesting that the city was able to just clean it up and go about their way. If it had been anyone else they would have pulled the HazMat plug and fined everyone they could. Now the sewage is part of the SLO good old boy club.